I will openly admit that I have a lot of interests, as many other American men do. So with that said as long as I am going to spend 8 hours a day behind a desk unable to partake in those interests, I would at least like to listen to podcasts on them so I can be informed and have fun that way. For some of my hobbies there aren’t any really good podcast, or in some cases any podcasts at all. But, when it comes to retro gaming there are a lot of really good ones, some of which I have covered in previous blog entries. and running config files, etc….”, as well as a few other questions all of which I answered yes to. 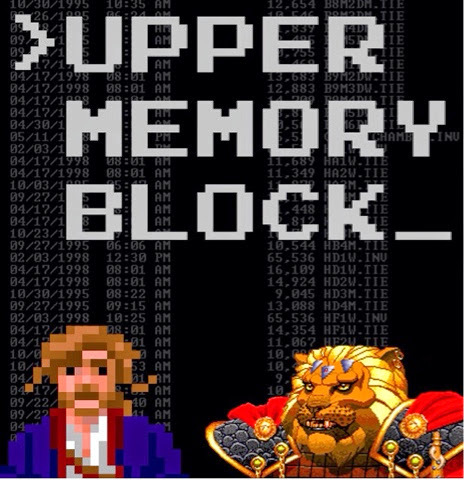 The ad was by Joe Mastroianni host of the Upper Memory Block podcast, a podcast on retro PC gaming, and exactly the type of podcast I had been searching for. With only a few minutes of the Retro Rewind Podcast left to go, I plugged the Upper Memory Block into an iTunes search and in a few seconds I had found a podcast that seemed to sum up all of my recollections of my PC gaming days. The backlog of episodes covered games like, Wing Commander, Command & Conquer, Mechwarrior, Strike Commander, Railroad Tycoon, and many other classics. The first episode I listened to was Emulation, which was fantastic episode that introduced me to many of the great emulation methods out there for old pc games like ScummVM, and the DOSBox front end application D-Fend. The episode provided me with a huge amount of insight into how to use DOSBox’s somewhat confusing set-ups, and how to make it all easier. I went on to enjoy a lot of other episodes on some of the great games I remembered, and the podcast became a staple in my iPhones podcast library. I would like to compare the Upper Memory Block to the Atari 2600 Game by Game Podcast, due to the fact that they both podcast have similar formats. Joe much like Ferg, is incredibly likable, and really makes the show worth listening to due to his love for the subject. Joe, much like Ferg also gets very in-depth with the games, he talks about game play, control methods, his memories of playing, and of course he talks about the games development. In comparison to Atari 2600 games PC games have a lot more back story that goes into development, and Joe has some really great stories about them. Joe also rates the games at the end of each episode, based on whether he believes the games stand up against the test of time or not. I like this segment because it really puts the games into perspective, as to whether or not they were truly something special or just a stepping stone in a long line of games to come. He also ends the show by telling you where to find the games if you want to try them yourself, letting you know if they are on Steam, GoG, or some other site, or if eBay is your only option. Thanks to this segment I have become an avid GoG, and Steam user. As for the show itself you have to keep in mind that it’s a single host program, so you not going to get the banter and the conversation between friends effect, that you do on two or more host programs. With that said Joe is pretty engaging on the subject of PC games, and he knows how to keep the show moving, and keep it lively. The shows average about an hour long each, and for the most part cover one game, but he will sometimes cover a series of games much like he did in the Descent, and Doom episodes. The subject matter is always presented in an interesting way, and not hectically paced even for the series episodes I just discussed. The only time music is played in the background is when Joe is discussing the music for the game so there’s no music playing distractingly through the whole podcast, which allows you to focus on the subject matter a little more. Joe, also makes himself really accessible to his listeners which is really great when you have a question about a game or emulator. This is another reason why his program is so great. This podcast is a must for anyone who has an interest in old PC games of the pre-Windows XP era, or just anyone who wants to share in a bit of nostalgia about that era.